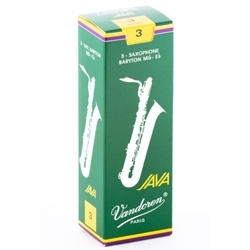 Originally developed in 1983 to address the particular needs of jazz and commercial music players, the Java Green reeds have been embraced by the saxophone playing world for their practicality, usability, durability, consistency and tone. The baritone reeds within the Java Green line have been long anticipated and they are at last here. They have a thicker tip and a more flexible pallet than traditional reedss, which allows vibration over a larger surface with maximum elasticity.